The document Unitatis Redintegratio (21 Nov. 1964) of the Second Vatican Council stresses spiritual ecumenism. Sometimes we overlook this aspect. But we can’t but focus on what is the soul of the ecumenical movement; theologians and church leaders have a lot of work to do on this point; I recall that the saints have kept their eyes on this method, and so we as members of the Body of Christ have to keep focused on daily conversion, a daily turn toward the Lord. 1. there’s no unity without conversion of heart, which includes forgiving and asking for forgiveness. 2. there is no unity without prayer and therefore men and women religious who pray for unity are like ‘an invisible monastery’ bringing together Christians of different denominations from different countries around the world. 3. there is no unity without holiness of daily life. so the more we put our search for unity into practise in our relations with others, the more we will be modelling our lives on the message of the Gospel. The Week of Prayer for Christian Unity which concludes today (the feast of the Conversion of St Paul) meditated on the theme, “Give me a drink,” from the narrative of the Samaritan woman meeting Jesus. The Holy Father is making a pilgrimage this May 24-26. The Assembly of Catholic Ordinaries of the Holy Land held a planning meeting in Tiberias where they settled on a theme and logo for Francis and the ecumenical as Ut unum sint. 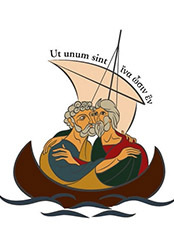 The logo (seen here) shows the embrace of Saints and Apostles Peter and Andrew. The two are known as the first-called by Jesus in Galilee, patrons respectively of the Church of Rome and the Church of Constantinople. The news was announced by Terra Sancta. This is not merely a “trip” but a pilgrimage. The distinction focuses attention to the spiritual and fraternal aspects of being present in a particular place for a particular reason. Pope Francis and Patriarch Bartholomew will meet in the Basilica of the Holy Sepulchre in order to commemorate and renew the yearning for unity among Christians. The meeting recalls a similar meeting 50 years ago of Pope Paul VI and Patriarch Athenagoras in Jerusalem. At Solemn Vespers for the Solemnity of the Conversion of Saint Paul this evening, Pope Francis preached the following homily at the Basilica of St Paul outside the Walls. 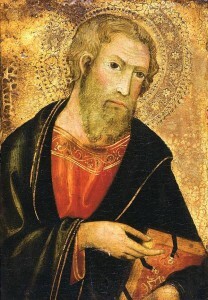 The Apostle was grieved to learn that the Christians of Corinth had split into different factions. Some claimed: “I belong to Paul”; while others claimed: “I belong to Apollos” or “I belong to Cephas”, and others yet claimed: “I belong to Christ” (cf. v. 12). Paul could not even praise those who claimed to belong to Christ, since they were using the name of the one Savior to set themselves apart from their other brothers and sisters within the community. In other words, the particular experience of each individual, or an attachment to certain significant persons in the community, had become a yardstick for judging the faith of others. Amid this divisiveness, Paul appeals to the Christians of Corinth “by the name of our Lord Jesus Christ” to be in agreement, so that divisions will not reign among them, but rather a perfect union of mind and purpose (cf. v. 10). The communion for which the Apostle pleads, however, cannot be the fruit of human strategies. Perfect union among brothers and sisters can only come from looking to the mind and heart of Christ Jesus (cf. Phil 2:5). This evening, as we gather here in prayer, may we realize that Christ, who cannot be divided, wants to draw us to himself, to the sentiments of his heart, to his complete and confident surrender into the hands of the Father, to his radical self-emptying for love of humanity. Christ alone can be the principle, the cause and the driving force behind our unity. As we find ourselves in his presence, we realize all the more that we may not regard divisions in the Church as something natural, inevitable in any form of human association. Our divisions wound Christ’s body, they impair the witness which we are called to give to him before the world. The Second Vatican Council’s Decree on Ecumenism, appealing to the text of Saint Paul which we have reflected on, significantly states: “Christ the Lord founded one Church and one Church only. However, many Christian communities present themselves to people as the true inheritance of Jesus Christ; all indeed profess to be followers of the Lord but they differ in outlook and go their different ways, as if Christ were divided”. And the Council continues: “Such division openly contradicts the will of Christ, scandalizes the world, and damages the sacred cause of preaching the Gospel to every creature” (Unitatis Redintegratio, 1). The work of these, my predecessors, enabled ecumenical dialogue to become an essential dimension of the ministry of the Bishop of Rome, so that today the Petrine ministry cannot be fully understood without this openness to dialogue with all believers in Christ. We can say also that the journey of ecumenism has allowed us to come to a deeper understanding of the ministry of the Successor of Peter, and we must be confident that it will continue to do so in the future. As we look with gratitude to the progress which the Lord has enabled us to make, and without ignoring the difficulties which ecumenical dialogue is presently experiencing, let us all pray that we may put on the mind of Christ and thus progress towards the unity which he wills. In this climate of prayer for the gift of unity, I address a cordial and fraternal greeting to His Eminence Metropolitan Gennadios, the representative of the Ecumenical Patriarch, and to His Grace David Moxon, the personal representative in Rome of the Archbishop of Canterbury, and to all the representatives of the various Churches and Ecclesial Communities gathered here this evening. Dear brothers and sisters, let us ask the Lord Jesus, who has made us living members of his body, to keep us deeply united to him, to help us overcome our conflicts, our divisions and our self-seeking, and to be united to one another by one force, by the power of love which the Holy Spirit pours into our hearts (cf. Rom 5:5). Amen. 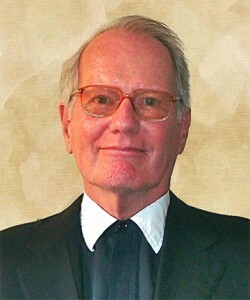 Prayers for Brother Jeffrey Gros, FSC who died yesterday. He’s been living with cancer. Brother Jeffrey was a terrific leader in the ecumenical movement in the USA for many years. Brother was indeed, a public thinker in theology, ecumenics, and catechesis; numerous academic papers fill his CV. May the Holy Mother of God and Saint John Baptist de la Salle assist Brother Jeffrey before the Throne of Grace. Here is part II of the papal interview between Francis and the journalists on in-flight back to Rome from Rio, Sunday, 28 July 2013. A question about your feelings. You commented a week ago on the child who asked you how you felt, if someone could imagine how he could be Pope and if he could wish for it. You said one had to be mad to do it. After your first multitudinous experience, such as these days in Rio have been, can you tell us how you feel about being Pope, if it’s very hard, if you’re happy being so and, in addition, if in some way it has enhanced your faith or on the contrary, if you have had doubts. Thank you. To do the work of a bishop is a good thing, it’s good. The problem is when one seeks that work: this isn’t so good, this isn’t from the Lord. But when the Lord calls a priest to become bishop, this is good. There’s always the danger of thinking oneself superior to others, not as others, somewhat as a prince. These are dangers and sins. But the work of a bishop is good: it’s to help brothers to go forward. The bishop in front of the faithful, to show the way; the bishop in the midst of the faithful, to aid communion; the bishop behind the faithful, because the faithful so many times have the scent of the way. The bishop must be like this. The question was if I like it? I like being bishop, I like it. I was so happy at Buenos Aires, so happy! I have been happy, it’s true. The Lord has helped me in that. But I was happy as a priest, and I’ve been happy as a bishop. In this regard I say: I like it! Also! Also! When the Lord puts you there, if you do what the Lord wants, you are happy. This is my sentiment, what I feel. I can’t even get up. I’m sorry, I can’t even stand up because of the many children I have at my feet. We saw in these days, we saw you full of energy even late in the evening. We are seeing it now with the plane that shakes, that you are standing calmly, without an ounce of hesitation. We wish to ask you: there is much talk of forthcoming trips. There’s talk of Asia, Jerusalem, Argentina. Do you already have a more or less definite calendar for the coming year, or is it all yet to be seen? Nothing is defined, defined. But I can say something to which thought is being given. It’s defined – sorry – September 22 to Cagliari. Then, on October 4 to Assisi. In mind, within Italy, I would like to meet my own one day: go by plane in the morning and return with the others because they, poor things, call me and we have a good relationship. But only one day. Outside of Italy: Patriarch Bartholomew wants to have a meeting to commemorate the 50 years of Athenagoras and Paul VI at Jerusalem. The Israeli government has also extended a special invitation to go to Jerusalem. I believe the government of the Palestinian Authority has done the same. Thought is being given to this: it’s not certain whether one will or will not go … Then, in Latin America, I don’t think there is the possibility to return because the Pope is Latin American, the first trip was in Latin America … goodbye! We must wait a bit! I think we can go to Asia, but this is all in the air. I received an invitation to go to Sri Lanka and also to the Philippines. But we must go to Asia. Because Pope Benedict did not have the time to go to Asia, and it’s important. He went to Australia and then to Europe, America, but Asia … To go to Argentina: at present I think we can wait a bit, because all these trips have a certain priority. I would like to go to Constantinople, on September 30, to visit Bartholomew I, but it’s not possible, it’s not possible because of my agenda. If we meet, we’ll do so at Jerusalem. Fatima, there is also an invitation to Fatima, it’s true, it’s true. There’s an invitation to go to Fatima. Hello … you are holding up better than me … No, no, no: ok, ok. My question is: when you met with Argentine young people, somewhat jokingly, perhaps somewhat seriously you said to them that you, also, sometimes feel caged: we would like to know what you were referring to, exactly. Now we call on a Brazilian again: it’s Marcio Campos, and I also ask Guenois to come close for the next turn, for the French. I was asking the time, because they must serve supper, but are you hungry? Your blessing, Holy Father. I want to say to you when you feel longing for Brazil, for the joyful Brazilian people, embrace the flag that they gave you. I want to say also that I want to thank my colleagues of the newspapers Folha de Sao Paulo, Estado, Globo and Veja for representing them with a question. Holy Father, it’s very difficult to accompany a Pope. We are all tired. You are fine and we are tired. In Brazil, the Catholic Church has lost faithful over the years. Is the Charismatic Renewal Movement a possibility to avoid the faithful joining the Pentecostal churches? Thank you very much for your presence, and thank you very much for our being on your flight. What you say is very true about the loss of faithful: it’s true, it’s true. There are statistics. We spoke with the Brazilian bishops about the problem, in a meeting we had yesterday. You asked about the Charismatic Renewal Movement. I’ll tell you something. In the years, at the end of the 70s, beginning of the 80s, I couldn’t stand them. Once, speaking of them, I said this phrase: “They confuse a liturgical celebration with a samba school!” I said this. But I repented. Then, I got to know them better. It’s also true that the Movement, with good advisers, has gone on a good path. And now I think this Movement has done so much good to the Church in general. At Buenos Aires, I met with them often and once a year had a Mass with all of them in the Cathedral. I’ve always favored them, after I was converted, when I saw the good they do. Because at this moment of the Church – and here I lengthen the answer a bit – I think the Movements are necessary. The Movements are a grace of the Holy Spirit. “But how can one stop a Movement that is so free?” The Church is also free! The Holy Spirit does what He wishes. Then He does the work of harmonizing, but I think the Movements are a grace, those Movements that have the spirit of the Church. Because of this, I think that the Charismatic Renewal Movement not only serves to avoid some going to join Pentecostal confessions. But no! It serves the Church! It renews us. And each one seeks his Movement according to his charism, where the Spirit takes him. Well then, Guenois of Le Figaro for the French group. Holy Father, a question with my colleague of La Croix, also: You said that the Church without women loses fecundity. What concrete measures will you take? For instance, a feminine diaconate or a woman head of a dicastery? It’s a very small technical question: You said you were tired. Do you have a special preparation for the return? Thank you, Holiness. We begin with the last. This plane doesn’t have special preparations. I’m in front, in a good armchair, common, but ordinary, such as everyone has. I had a letter written and a telephone call made to say that I didn’t want special preparations on the plane: is it clear? Second, women. A Church without women is like the Apostolic College without Mary. The role of women in the Church is not only maternity, the mother of the family, but it’s stronger: it is, in fact, the icon of the Virgin, of Our Lady, the one who helps the Church grow! But think that Our Lady is more important than the Apostles! She is more important! The Church is feminine: she is Church, she is spouse, she is Mother. But women in the Church, not only must … I don’t know how it’s said in Italian … a woman’s role in the Church must not end only as mother, as worker, limited. No! It’s something else! But the Popes … Paul VI wrote a very beautiful thing on women, but I think we must go further in making the role and charism of women more explicit. A Church without women can’t be understood, but active women in the Church, with their profile, which they carry forward. I’m thinking of an example that has nothing to do with the Church, but it’s an historical example: in Latin America, in Paraguay. For me, the Paraguayan woman is the most glorious of Latin America. Are you Paraguayan? After the war, there were eight women for every man and these women made a rather difficult choice: the choice of having children to save the homeland, the culture, the faith and the language. In the Church, it must be made more explicit. I think we have not yet made a profound theology of woman in the Church. She can only do this or that, now she is an altar server, then she does the Reading, she is president of Caritas. But there is more! A profound theology must be made of woman. This is what I think. Now for the Spanish group, we have Pablo Ordaz of El Pais. We wanted to know your relation of work, not so much as friend, of collaboration with Benedict XVI. There’s never been a circumstance like this before, and if you have frequent contacts, and if he is helping you with this burden. Thank you very much. There is something that qualifies my relation with Benedict: I love him so much. I’ve always loved him. For me he is a man of God, a humble man, a man who prays. I was so happy when he was elected Pope. Also when he gave his resignation, it was for me an example of greatness! A great man. Only a great man does this! A man of God is a man of prayer. He now lives in the Vatican, and some say to me: but how can this be? Two Popes in the Vatican! But, doesn’t he encumber you? Doesn’t he make a revolution against you? All these things that are said, no? I’ve found a phrase to say this: “It’s like having a grandfather at home,” but a wise grandfather. When a grandfather is at home with a family, he is venerated, loved, listened to. He is a man of prudence! He doesn’t meddle. I’ve said to him so many times: “Holiness, you receive, make your life, come with us.” He came for the inauguration and blessing of the statue of Saint Michael. There, that phrase says everything. For me he is like having a grandfather at home: my father. If I had a difficulty or something I didn’t understand, I would telephone him: “But, tell me, can I do that?” And when I went to talk about that big problem of Vatileaks, he told me everything with a simplicity … at the service. It’s something I don’t know if you know, I think so, but I’m not sure: when he spoke to us, in his farewell address on February 28, he said to us: “The next Pope is among you: I promise obedience to him.” But he’s a great man, he is a great! Well now we give the floor again to a Brazilian, Anna Ferreira; and now Gian Guido Vecchi is also coming for Italian. Holy Father, good evening. Thank you. I would like to say “thank you” so many times: thank you for having brought so much joy to Brazil, and thank you also for answering our questions. We, journalists, are so fond of asking questions. I would like to know, why, yesterday, you spoke to the Brazilian Bishops about women’s participation in our Church. I’d like to understand better: how should this participation be for us, women in the Church? If you … what do you think of the ordination of women? What should our position in the Church be? I would like to explain a bit what I said on the participation of women in the Church: it can’t be limited to being altar servers or presidents of Caritas, catechists … No! It must be more, but profoundly more! Even mystically more, with what I’ve said of the theology of woman. And, with reference to the ordination of women, the Church has spoken and she said : “No.” John Paul II said it, but with a definitive formulation. That is closed, that door is closed, but I’d like to say something about this. I’ve said it, but I repeat it. Our Lady, Mary, was more important than the Apostles, than bishops, deacons and priests. In the Church, woman is more important than bishops and priests; how, it’s what we must seek to make more explicit, because theological explicitness about this is lacking. Thank you. Gian Guido Vecchi, of Corriere della Sera: I ask Mrs. Pigozzi and Nicole then, to come after. 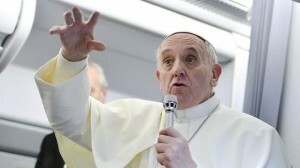 Holy Father, during this trip you have spoken many times about mercy. In regard to access to the sacraments of divorced persons who have remarried, is there a possibility that something will change in the discipline of the Church? That these sacraments be an occasion to bring these people closer, rather than a barrier that separates them from the other faithful? This is a subject that is always asked about. Mercy is greater than the case you pose. I believe this is the time of mercy. This change of era, also so many problems of the Church – such as the witness that’s not good of some priests, also problems of corruption in the Church, also the problem of clericalism, to give an example — have left so many wounds, so many wounds. And the Church is Mother: she must go to heal the wounds with mercy. But if the Lord does not tire of forgiving, we have no other choice than this: first of all, to cure the wounds. The Church is Mother and must go on this path of mercy. And find mercy for all. But I think, when the Prodigal Son returned home, his father didn’t say: “But you, listen sit down: what did you do with the money?” No! He had a feast! Then, perhaps, when the son wished to speak, he spoke. The Church must do likewise. When there is someone … not just wait for them: go to find them! This is mercy. And I believe that this is a kairos: this time is a kairos of mercy. But John Paul II had this first intuition, when he began with Faustina Kowalska, the Divine Mercy … he had something, he had intuited that it was a necessity of this time. With reference to the problem of Communion, it’s not a problem, but when they are in a second union, they can’t. I think that it’s necessary to look at this in the totality of matrimonial ministry. And because of this it’s a problem. But also –a parenthesis – the Orthodox have a different practice. They follow the theology of the economy, as we call it, and give a second possibility, they allow it. But I think this problem – I close the parenthesis – must be studied in the framework of matrimonial ministry. And because of this, two things: first, one of the subjects to be consulted with these eight of the Council of Cardinals, with whom we will meet, the 1st, 2nd and 3rd of October, is how to go forward in matrimonial ministry, and this problem will arise there. And, a second thing: Fifteen days ago, the secretary of the Synod of Bishops was with me, for the topic of the next Synod. It was an anthropological topic, but speaking and speaking again, going and returning, we saw this anthropological topic: how faith helps the planning of the person, but in the family, and to go, therefore, to matrimonial ministry. We are on the way for a somewhat profound matrimonial ministry. And this is everyone’s problem, because there are so many, no? For instance, I’ll mention only one: Cardinal Quarracino, my predecessor, said that for him half of all marriages are null. Why did he say this? Because they get married without maturity, they marry without remembering that it’s for the whole of life, or they marry because socially they must marry. And the matrimonial ministry also comes into this. And also the judicial problem of the nullity of marriages, this must be reviewed, because the Ecclesiastical Tribunals are not enough for this. The problem of the matrimonial ministry is complex. Thank you. Thank you. Now, then, we have Mrs. Pigozzi who is of Paris Match, and again of the French group. Good evening, Holy Father. I would like to know if you, since you’ve been Pope, still feel yourself a Jesuit. It’s a theological question, because Jesuits take the vow of obedience to the Pope. But if the Pope is a Jesuit, perhaps he should take a vow of obedience to the General of the Jesuits … I don’t know how this is resolved … I feel myself a Jesuit in my spirituality, in the spirituality of the Exercises, spirituality, the one I have in my heart. But I feel so much like this that in three days I’ll go to celebrate with Jesuits the feast of Saint Ignatius: I will say the morning Mass. I haven’t changed my spirituality, no. Francis, Franciscan: no. I feel myself a Jesuit and I think like a Jesuit. Not hypocritically, but I think as a Jesuit. Thank you. If you can still bear it, there are still some questions. Now, Nicole Winfield, who is from Associated Press, and there are … but he wasn’t … but, I had a list and I really believed that you were organized … So, ok, Elisabetta, join the list also, sorry. Holiness, thank you again for having come “among the lions.” Holiness, at the fourth month of your pontificate, I would like to ask you to make a small evaluation. Can you tell us what was the best thing of being Pope, an anecdote, and what was the worst thing, and what was the thing that surprised you most in this period? But I don’t know how to answer this, really. Big thing, big things didn’t happen. Beautiful things, yes, for instance, the meeting with Italian Bishops was so good, so good. As Bishop of the capital of Italy, I felt I was at home with them. And that was lovely, but I don’t know if it was the best. Also a painful thing, which affected my heart a lot, the visit to Lampedusa. But that’s something to weep about, that did me good. But when these boats arrive they leave some thousands there before the coast and they must arrive alone with the boat. And this makes me grieve because I think that these persons are victims of a global socio-economic system. But the worst thing – I’m sorry – that happened to me was sciatic –truly! – I had that the first month because to do the interviews I sat in an armchair, and this gave me some grief. It’s a very painful sciatic, very painful! I don’t wish it on anyone! But these things: to talk with people; the meeting with seminarians and women religious was very lovely, was very lovely. Also the meeting with the students of the Jesuit colleges was very lovely, good things. What is the thing that surprised you most? The people, the people, the good people I’ve met. I’ve met so many good people in the Vatican. I thought what I should say, but that is true. I do justice, saying this: so many good people. So many good people, so many good people, but good, good, good! Elisabetta, but you know her and also Sergio Rubini, perhaps is coming close, so we have the Argentines. Pope Francis, first of all on behalf of the 50,000 Argentines that I met there and who said to me: you are going to travel with the Pope? Please, tell him he was fantastic, stupendous, ask him when he is going to travel, but you already said you aren’t going to travel … So I’m going to ask you a more difficult question. Did you get scared when you saw the “Vatileaks” report? No, I’m going to tell you a story about the “Vatileaks” report. When I went to see Pope Benedict, after praying in the chapel, we went to his study and I saw a big box and a thick envelope. Benedict. Benedict said to me: “All the statements, the things that the witnesses said are in this big box, all are there. But the summary and the final judgment are in this envelope. And here one says ta-ta-ta …” He had everything in his head! But what intelligence! Everything memorized everything! But no, (words in Spanish) I didn’t get sacred, no. No, no. But it’s a big problem, alas. But I didn’t get scared. Holiness, two little things. This is the first one: You have insisted a lot on halting the loss of faithful. In Brazil, it’s been very strong. Do you hope that this trip will contribute to having many people return to the Church, to feel closer to her? And the second, the more personal: you like Argentina a lot, and you have Buenos Aires very much in your heart. Argentines are wondering if you miss that Buenos Aires, the Buenos Aires you went around in a bus, on the streets. Thank you very much. I think a papal trip always does one good. I believe this will do good to Brazil, but not only the presence of the Pope, but what was done in this World Youth Day, they mobilized and they will do so much good, perhaps they will help the Church a lot. But these faithful who have gone away, so many aren’t happy because they feel they belong to the Church. I believe this will be positive, not only because of the trip, but above all because of the Days, the Day was a wonderful event. And of Buenos Aires, yes, at times I miss it. And that I’ve felt. But it is a serene missing, a serene missing, it is a serene missing. But I think that you, Sergio, know better than all the others, you can answer this question, with the book you’ve written! Now we have the Russian and then Valentina, who was the dean, who wanted to close. Good evening Holy Father. Holy Father, returning to ecumenism: today the Orthodox are celebrating 1,025 years of Christianity. There are great celebrations in many capitals. Would you like to comment on this event, I would be happy if you did. Thank you. In the Orthodox Churches they have kept that pristine liturgy, so beautiful. We have lost a bit the sense of adoration. They keep, they praise God, they adore God, they sing, time doesn’t count. God is the center, and this is a richness that I would like to say on this occasion in which you ask me this question. Once, speaking of the Western Church, of Western Europe, especially the Church that has grown most, they said this phrase to me: “Lux ex oriente, ex occidente luxus.” Consumerism, wellbeing, have done us so much harm. Instead you keep this beauty of God at the center, the reference. When one reads Dostoyevsky – I believe that for us all he must be an author to read and reread, because he has wisdom – one perceives what the Russian spirit is, the Eastern spirit. It’s something that will do us so much good. We are in need of this renewal, of this fresh air of the East, of this light of the East. John Paul II wrote it in his Letter. But so many times the luxus of the West makes us lose the horizon. I don’t know, it came to me to say this. Thank you. And now we close with Valentina that, as she began in the trip of departure, now closes on the return trip. It doesn’t matter, it doesn’t matter … well, the serious question on behalf of all the Mexicans: When are you going to Guadalupe? But that one is of the Mexicans. Mine is: you are going to canonize two great Popes, John XXIII and John Paul II. I would like to know, in your opinion, what is the model of holiness that issues from one and the other and the impact they’ve had on the Church and on you. John XXIII is somewhat the figure of the “country priest,” the priest who loves each one of the faithful, who knows how to care for the faithful and he did this as bishop as well as nuncio. But how many testimonies of false Baptism he did in Turkey in favor of the Jews! He was a courageous man, a good country priest, with such a great sense of humor, so great, and great holiness. When he was nuncio, some didn’t like him so much in the Vatican, and when he arrived to bring things or ask for things, in certain offices they made him wait. He never, never lamented it: he prayed the Rosary, read the Breviary. Also he was one who was concerned for the poor. When Cardinal Casaroli returned from a mission – I believe in Hungary or in what was Czechoslovakia at that time, I don’t remember which of the two – he went to him to explain how the mission was, in that period of diplomacy of “small countries.” And they had the audience – 20 days later John XXIII was dead – and while Casaroli was going, he stopped him: “Ah Eminence – no, he wasn’t Eminence – Excellency, a question: do you continue to go to those youths?” Because Casaroli went to the prison of minors of Casal del Marmo and played with them. And Casaroli said: Yes, yes!” “Don’t ever abandon them.” This to a diplomat, who arrived from a tour of diplomacy, a very demanding trip, John XXIII said: “Don’t ever abandon the boys.” But he was a great man, a great man! Then there is the question of the Council: he was a man who was docile to the voice of God, because what came to him from the Holy Spirit came to him and he was docile. Pius XII thought of doing it, but the circumstances weren’t ripe to do it. I think that he [John XXIII] didn’t think of the circumstances: he felt that and he did it. A man who let himself be guided by the Lord. Of John Paul II I wish to say he was “the great missionary of the Church”: he was a missionary, a missionary, a man who took the Gospel everywhere, you know it better than me. But how many trips did he make? But he went! He felt the fire of taking forward the Word of the Lord. He is a Paul, he is a Saint Paul, he is such a man; for me this is great. And to do the ceremony of canonization of the two together I believe is a message for the Church: these two are brave, they are brave, they are two brave men. But there is underway the cause of Paul VI and also of Pope Luciani: these two are on the way. But, again something that I believe I said, but I don’t know if here or elsewhere: the date of canonization. We thought December 8 of this year, but there’s a big problem; those who come from Poland, the poor, because those who have means can come by plane, but those who come, the poor, come by bus and in December the roads already have ice and I think the date must be thought out again. I spoke with Cardinal Dziwisz and he suggested two possibilities: either Christ the King of this year or the Sunday of Mercy of next year. I think Christ the King is too short a time for this year, because the Consistory will be on September 30 and at the end of October there is little time, but I don’t know, I must speak with Cardinal Amato about this. But I don’t think it will be December 8. But will they be canonized together? Together all two together, yes. In regard to Monsignor Ricca, I’ve done what Canon Law orders to do, which is the investigatio previa. And from this investigatio there is nothing of which they accuse him, we haven’t found anything of that. This is the answer. But I would like to add something else on this: I see that so many times in the Church, outside of this case and also in this case, they go to look for the “sins of youth,” for instance, and this is published. Not the crimes, alas. Crimes are something else: the abuse of minors is a crime. No, the sins. But if a person, lay or priest or Sister, has committed a sin and then has converted, the Lord forgives, and when the Lord forgives, the Lord forgets and this is important for our life. When we go to confession and truly say: “I have sinned in this,” the Lord forgets and we don’t have the right not to forget, because we run the risk that the Lord won’t forget our [sins]. That’s a danger. This is important: a theology of sin. I think so many times of Saint Peter: he committed one of the worst sins, which is to deny Christ, and with this sin he was made Pope. We must give it much thought. But, returning to your more concrete question: in this case, I’ve done the investigatio previa and we found nothing. This is the first question. Then you spoke of the gay lobby. Goodness knows! So much is written of the gay lobby. I still have not met one who will give me the identity card with “gay” . They say that they exist. I think that when one meets a person like this, one must distinguish the fact of being a gay person from the fact of doing a lobby, because not all lobbies are good. That’s bad. If a person is gay and seeks the Lord and has good will, who am I to judge him? The Catechism of the Catholic Church explains this in such a beautiful way, it says, Wait a bit, as is said and says: “these persons must not be marginalized because of this; they must be integrated in society.” The problem isn’t having this tendency, no. We must be brothers, because this is one, but there are others, others. The problem is the lobbying of this tendency: lobby of the avaricious, lobby of politicians, lobby of Masons, so many lobbies. This, for me, is the more serious problem. And I thank you. Thank you. It seems to me we can’t do much more. We have even abused the Pope who told us he was a bit tired and we now hope he will rest a bit. Thank you and good night, good trip and good rest.